Lisburn based Pure Roast Coffee is going from strength to strength; and not just in its caffeine as it continues to invest in the Lisburn Castlereagh area and expand into new marketplaces. Pure Roast Coffee, formed in 2009 by Martin Symington, is an award-winning coffee roaster and coffee pod manufacturer, which sells its products to markets as diverse as the UK and the Middle East. It uses ‘hot air’ for the convection roasting of the coffee beans for all its coffee pods and pads. Alderman Allan Ewart MBE, Chairman of the Council’s Development Committee, recently visited the premises to hear about the business’s growth plans. 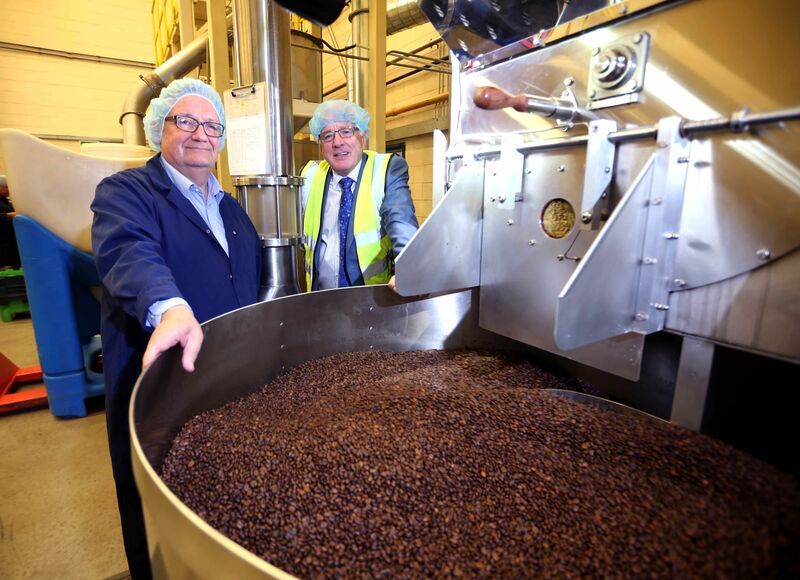 Speaking about the visit Alderman Ewart MBE said: “The aroma of coffee at the premises is as powerful as the business model for Pure Roast Coffee, which manufactures over 18 million coffee pods a year in Lisburn for distribution across the world. It has steadily increased its portfolio and customer base since it attained the British Retail Consortium (BRC) Grade A accreditation in 2012. “Pure Roast Coffee is recognised by several major food and drink sector companies as an expert on the production of innovative quality coffee single-serve pods. Through a £350,000 investment last year, Martin’s business has grown its online presence, tripled its output of products while reducing energy costs, increasing its workforce, warehouse and processing areas. “With high profile clients and major airlines on its ‘books’ and its multi-award winning haul of 14 Good Taste Awards in 2014 has helped secure interest in Pure Roast Coffee products from the Chinese marketplace. I wish Martin, who is a true entrepreneur, every success in his upcoming discussions with a key player in the Chinese high-end retail sector later this month,” concluded Alderman Ewart MBE.